The deterioration of Sinhalese-Tamil Relations (STR), Sinhalese-Muslim Relations (SMR) and Tamil-Muslim Relations (TMR) are three interconnected segments of the same macro-issue of plurality mismanagement. I have discussed this problem in an earlier piece (Colombo Telegraph: 1 November 2017). However, among these segments, the last, TMR, has not been well understood by many and received scant reference in published writings and discussions. I drew attention to this problem in another piece in this journal (Colombo Telegraph: 11 January, 2018). The Eastern Province (EP), which has nearly 43% of the country’s agricultural land and produces one quarter of the nation’s paddy, is emerging as the next theatre where TMR will come under severe strain due to issues that are peculiar to this province. An aggressive post-civil war policy of state aided colonization of this province, especially its Batticaloa District, with Sinhalese-only ex-army men and their families; and an equally aggressive mission of a few ultra-nationalistic Buddhist monks, who, basing their claims on invented myths and dubious archaeology, are on a spree to plant Buddha statues even on private lands legally owned by Tamils and Muslims, have already put STR and SMR in this province to a gruelling test. It is as a by-product of these two has TMR risen to add fuel to the fire. Demographically, EP’s population in the 2012 census showed nearly 40% Tamils, 37% Muslims and 23% Sinhalese. On district basis, the corresponding ratios were roughly 17% for Tamils, 44% for Muslims and 39% for Sinhalese in Ampara, 72% Tamils, 25% Muslims and 1% Sinhalese in Batticaloa, and 31% Tamils, 40% Muslims and 27% Sinhalese in Trincomalee. It is the very low percentage of Sinhalese population in the Batticaloa District, which is agonizingly worrying the ultra-Sinhala nationalists, who believe that Sinhala Buddhists must form the majority in every district and province of the country. Populating the Batticaloa District with more Sinhala Buddhists is their strategy to thwart any attempt by any government to bring into reality either a federal state or a merged North-Eastern Provincial Council in future. Thus, the deteriorating TMR in EP is an unfortunate consequence of what Michael Robert described as “majoritarian part subsuming the whole”. What is at stake in this ‘Great Game’ in EP among the three communities is the distribution of land. Muslims are the biggest losers in this distribution. Being one-third of the population of EP, Muslims hold only 3% of the land. Just as there was hunger for land amongst the Kandyan peasantry on the eve of independence there is now land hunger amongst Tamil and Muslim householders in EP. While the government is refusing to allocate crownland to the two national minorities, for fear of angering the Sinhala-Buddhist nationalists, the minorities in turn, with encouragement from their respective political leaders, are engaging in a mutually destructive game of encroaching into each other’s lands. It is this competition for land between Tamils and Muslims that is at the heart of the rouble in TMR, and the failure to solve it will cause another Tamil-Muslim riot in EP. 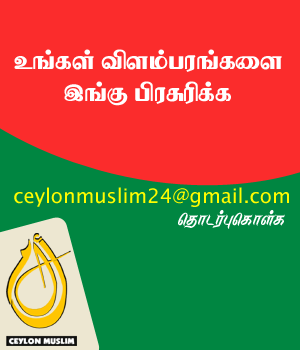 The concentration of Muslims and the massive size of their vote bank in the Ampara and Batticaloa districts has led to the emergence of a new generation of Muslim parliamentarians, of whom at least one entered the current legislature through the back door. Their lack of political far-sightedness and patriotic spirit has driven the Tamil and Muslim communities to the edge of another violent confrontation. The most disastrous outcome of their short sightedness and parochialism was the founding of the SLMC. This monster has caused enough trouble to the entire Muslim community in the island and unless it is dissolved it is bound to engender even more trouble particularly to the Muslims of EP. A few examples will help highlighting the danger that is facing the two communities in the Batticaloa and Ampara districts. In one of the recorded messages that has gone viral in the social media, one Muslim parliamentarian, who is also a minister in the MS-RW government, appears to brag that he had singlehandedly engineered to grab a piece of land that belongs to a Hindu temple and given it to the Muslims. Did this parliamentarian ever think of the repercussions that his act would cause within the Hindus? Is this not a blatant abuse of power? Very recently in another location, Attapalam near Addalaichenai, a Muslim landowner appears to have illegally acquired a few acres of paddy land that belonged to some poor Tamil peasants. Obviously, he could not have done this without some support from the Muslim politician of the area. Similarly, in the municipal area of Batticaloa itself, some Hindus have acquired land belonged to the mosque at Kalliyankadu, and built on it a Hindu prayer centre. Finally, it appears that the Urban Council of Kattankudy is planning to convert it into a Municipality by extending the area within its jurisdiction to include the adjacent Kallady, a Tamil settlement. Kattankudy is the most densely populated township in the country, where, according to the 2012 census, over 40,000 Muslims cramped into a land area of just 6km2. 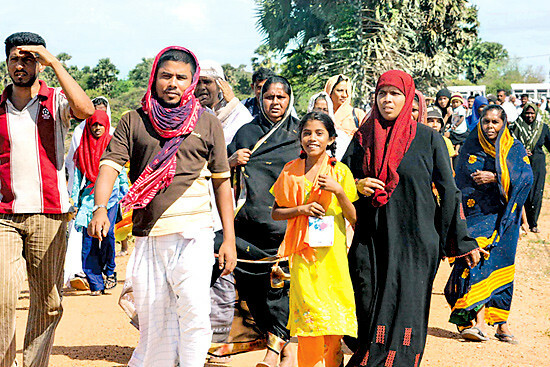 The Tamils of Kallady feel that the hidden agenda behind this plan is to acquire land for Muslims to spread out. They are already demonstrating against the move. A similar agenda may be the reason for the agitation for a separate council by another thickly populated Muslim township, Sainthamaruthu, with over 25,000 Muslims living in 8km2 area, and lies next to another Tamil settlement Karaitivu. What all these instances show is the absolute shortage of land for Tamils and Muslims. The obvious solution is for the two communities to join hands and agitate under a single banner for the release of more crown lands from government. The Muslim parliamentarians, who are all corrupt and holding ministerial positions in the present government, are obviously gutless to advance this cause, because that will jeopardise their status and positions with the regime. They do not want the two communities to join because they fear that such cooperation if succeeds, and there is no reason why it cannot, may pave the way for an eventual North-Eastern Provincial Council, which the Sinhala-Buddhist ultra-nationalists also reject. Such is the painful dilemma facing both minorities under leaders who do not realise that there is strength in unity. The Tamil and Muslim settlements in EP are delicately balanced. If this balance is disturbed and mismanaged, in the interest of political point scoring, some small pockets like the Muslim settlement at Kankeyanodai and Tamil settlement at Karaitivu, trapped between larger entities of Tamils and Muslims respectively, are bound to face grave danger. It is time that these two communities realise their common interests and join hands to make their voice heard by the rulers.